There are many moments in history that we all know very well. One of the most well-known and tragic points in American history is the assassination of President Abraham Lincoln. We all know of how it transpired, while at the theater with his wife, President Lincoln was shot by John Wilkes Booth. What many of us don't know is the conspiracy that took place months before the actual shooting. This and the subsequent trial is the subject of the film The Conspirator directed by Robert Redford and now released on DVD. The film stars James McAvoy as Frederick Aiken a young lawyer, who at the time of the shooting has finally returned from the civil war ready to start a new life far from the war. When the shooting takes place, Aiken happens to be down the road at a party of sorts sporting some of the big political names of the time. In the wake of the assassination a tracking party is formed and Booth is hunted down to a small barn many miles away. The mob takes swift action once Booth is cornered, trapping him in the barn and setting it on fire. As time passes and those in charge the investigation discover more evidence, it is uncovered that seven men and one woman conspired together to kill the president and others. Aiken is assigned the task of defending the one woman, Mary Surratt (Robin Wright), who claims she is innocent of her crimes. Naturally Aiken was just as shocked and angered by the tragedy that struck the nation, so he is extremely reluctant to put forth any effort in aiding Mary. During the opening proceedings of the trial however, Aiken realizes that regardless of what the law states she isn't going to receive any fair treatment. Aiken decides to put forth a real effort in rooting out what truths may lay beneath the surface. Aiken also realizes that not only is there more to the story of conspiracy being laid upon Mary's shoulders but the tribunal handling her the proceedings are using her as a bait and hostage to draw out the other members, one of whom is her own son. The film boasts an impressive cast, besides McAvoy and Wright; Kevin Kline, Tom Wilkinson, Evan Rachel Wood, Justin Long, Danny Huston, Colm Meaney, and Alexis Bledel. Each of the talented people does a superb job of bringing forth a sharp story that looks to the audience for its conclusions. Many films might use this event to give their own opinion of the woman involved. Redford on the other hand uses the available historical data to tell a consistent and well-thought story that paints its villain as neither good nor bad. Wright portrays Surratt as a woman resigned to the fact that this court has already made up its mind about her and there is nothing she can do to change it. All of this requires a lot of theory and philosophy and those most interested in American history will find this movie extremely engaging. The average movie goer though will find it hard to stay focused without the usual plot devices of romance, action, or comedy, which is a shame because Redford has delivered a smart film that, is uncommon in today's theaters. Now on DVD for the first time, it comes in a two-disc edition. Presented in widescreen with 5.1 Dolby digital audio as well as Spanish and English subtitles the film looks superb. On disc one is the full film along with audio commentary from Robert Redford, an introduction from The American Film Company (who had a strong hand in making this film) and the theatrical trailer. 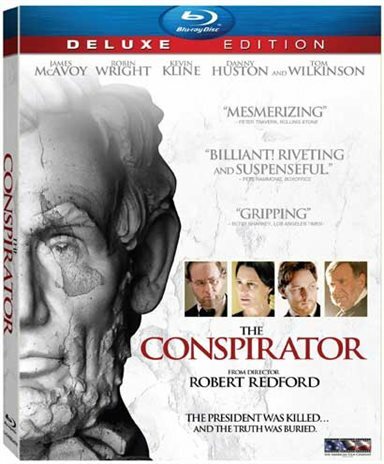 Over on disc two is a feature-length documentary titled "The Conspirator: The Plot to Kill Lincoln", a look into the making of the film, 10 "Witness History " featurettes on the history of this story, a photo gallery, and some TV spots. The effort that went into making this film is pretty impressive and anyone with an interest in learning history should pick this DVD up. On the back of the case is a message from The American Film Company stating its mission statement: "Founded on the belief that real life is more compelling than any fiction"; with goals such as that it is no surprise that The Conspirator is such dramatic and engaging story. Download The Conspirator from the iTunes Store in Digial HD. For more information about The Conspirator visit the FlickDirect Movie Database.